By the time this picture was taken, Vida Blue had struck out over 300 batters in a single season, won 20 games three times, and helped lead his team to three consecutive World Series championships. He was only 26 years old and must have felt unbeatable. When I was that age I’d been sharing a small apartment with my older brother for years and had begun to worry that he and I were destined to live together forever, like Miss Emily and Miss Mamie, the spinster sisters from The Waltons. My brother slept in one room and I slept on a loft bed in a converted closet. There were glow-in-the-dark stars on the ceiling above the loft bed, left over from when previous tenants used the bed for a young child. I worked six nights a week at a liquor store and got drunk on the weekends, coming home late to pass out below the dim plastic heavens. 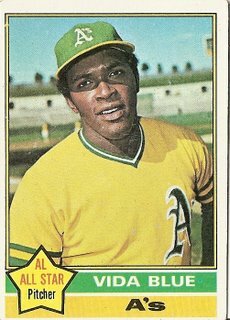 You are currently browsing the archives for the Vida Blue category.